Note from Editor: Project designer Howard Lamey has begun a groundbreaking series of vintage-style cardboard structure projects just for Halloween. After he made a great train station, I suggested a water tower as a followup, and this is what he put together. It's also the easiest structure to build so far, so it would be a good project to get the kids involved with. Some of the construction is very similar to building a glitterhouse, (the traditional pastboard houses that became popular in the early-to-mid 1900s) so we will refer to articles on glitterhouses in general from time to time. 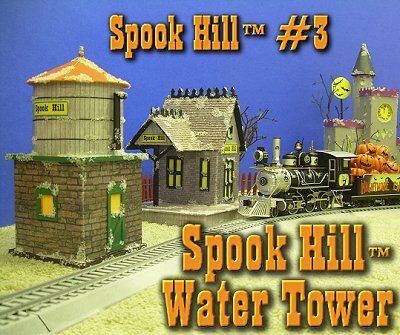 A note about stone versus timber water towers: When I asked Howard to consider designing a water tower for the Spook Hill™ station, his first design had timber supports, the kind you usually see on model railroads and old photos. But many small railroads of the 1800s and early 1900s supported their water tanks on brick or stone bases. The door represents the entry to the pumping machinery, which is hidden inside. This makes construction of this project a "breeze" compared to building a "timber" structure to support it. By increasing the size of this project by say 2 1/2 times, you can make a nice Large Scale version that would look good with LGB or AristoCraft trains (if you're running them indoors, that is). Update for 2009 - Tribute to Tinplate Version! - Since Paul and I designed this structure for his Spook Hill™ Halloween village and railroad, we have started a series of cardboard structures that pay Tribute to Tinplate - easy and inexpensive replicas of the great lithographed tinplate railroad structures of the early 1900s. 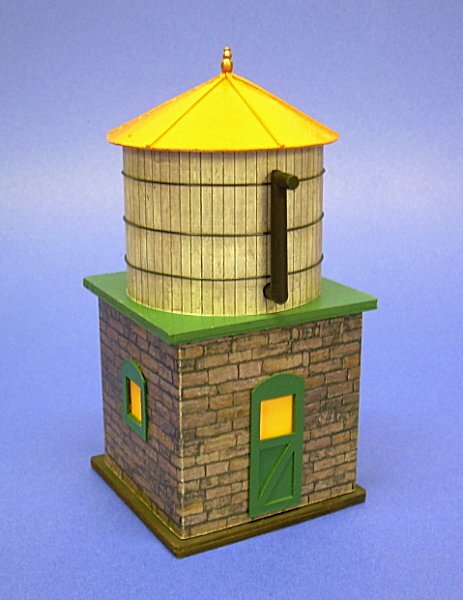 When I mentioned I was thinking about a water tower for our "tin city," Paul sent me new graphics that I used to make a version that looked like it belonged on an early toy train railroad. He has now included those graphics in our web sites so you can follow these instructions and make a tinplate-inspired version for your railroad, too. Clean cardboard (used is fine). This includes cereal boxes, the backs of writing tablets, corrugated box panels, anything flat, firm and clean, that you can save. For the bases on this project, I used heavy chipboard, that is - thick, but solid cardboard like that on the back of writing tablets. If you don't have that, you could alway build those bases out of fine corrugated cardboard and wrap them, the way we wrap bases in our Building Glitterhouse Bases article, but don't make them as thick as traditional glitterhouse bases. Acrylic craft paint for the door frames, window frames, bases, and trim. A cheap craft paint brush to cut apart and reglue for the spout. Yellow vellum, celophane, or similar translucent medium. I used a piece of flourescent yellow paper from the scrapbooking section of a craft store. It is so bright that the windows look like they are lit even when they're not. Brown florist wire to use as the "bands" that hold the tank together. Alternatively, you could just cut thin strips of dark brown paper and glue them on. A tube or can in the diameter you want (in this case we show 2 1/2 inches in diameter). It should be at least as wide as it is tall (preferably wider). This project has two structure patterns that you will need to cut out and transfer to cardboard, as well as three texture sheets that you will use to finish your station's appearance. You may print the structure patterns on any sort of paper, since you're simply using this to help you cut out your cardboard media. Note about Scale - The dimensions given in the plans above are for the S scale verion, assuming you can find a nice tube 2.5" in diameter. If your tube is a bit larger or smaller, all of the horizontal dimensions will have to change as well. If you have other scales, use the plan sheets as a reference, but use the diameter of the tube to determine the size of the supporting cube and other measurements. 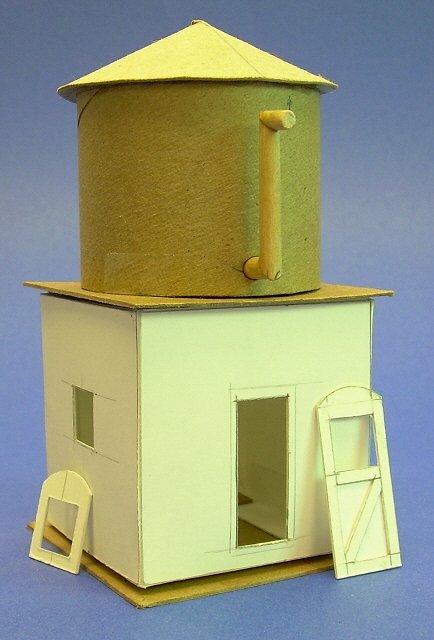 Also, this is a plan for a very small water tower, like you might find at a "whistle-stop station," so you can go half again as large if you want to. 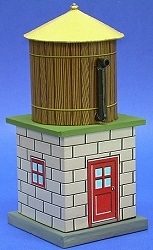 For an O scale water tower, try to find a tube that is 3.3" inches in diameter or larger. For an S scale tower, try to find a tube that is 2.5" in diameter or larger. For an HO scale tower, try to find a tube that is 1 3/4" in diameter or larger. For a TT scale tower, try to find a tube that is 1 1/4" in diameter or larger. For an N scale tower, try to find a tube that is 7/8" in diameter or larger. For a realistic or Halloween finish, consider using the following graphics. 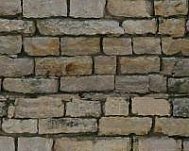 Stacked Stone Walls. 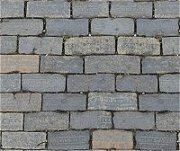 If you prefer, you could also use the same Hocking Valley Pavers, that Howard used on the Spook Hill™ Station walls. 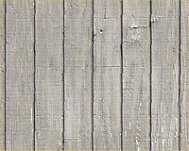 Note: If you are interested in building for larger scales, you will find larger versions of the same brick, stone, and wood patterns at the Family Garden Trains™Building Textures page. The final size of this project will depend in part on the size of the tube you use for a tank. I used a cardboard "spool" from Christmas ribbon with the "flanges" cut off. If the tube you use to give your tank shape has a wider diameter than mine, you will need to increase the base sizes, the lateral measurements of the walls, and the diameter of the roof piece to match. If your tube has open ends, you should cut out pieces like the one shown to the right and glue them in place now, so later on you have a surface to use when you glue the tank to other pieces. The exact measurement depends on the size of the tube you use. Unlike most of our related projects, this project has two bases. I cut six 2 7/8" squares and glued them together in two sets of three pieces, then let them dry overnight with something heavy on top to keep them flat. When they were thoroughly dry, I trimmed the edges smooth. Alternatively, if you have fine corrugated cardboard (like that the kind that comes from Express Mail boxes), you could use four squares, glued together in sets of two, and wrap them like we do in our Building Glitterhouse Bases article. Transfer the patterns to cardboard, making any adjustments you have to make because of tank size differences. Note: If you are creating the tinplate version, with the glued-on door and window, you don't have to cut out openings for those. Score the fold lines of the "stone" walls, then cut out that piece and fold on score lines. Assemble and glue the "cube" that will represent the stone base. Glue the roof together, using a clothespin or paper clip to hold it in shape until the glue is dry. Glue the door together, if applicable. Note: If you are using a glued-on door and window, be sure to leave the white strip at the top and one side of the graphic - it will help provide a three-dimensional appearance when it is glued to the background. To make the water spout, cut up and reglue the old paintbrush as shown in the plans. The photo at the right shows the major components stacked together to check for overall "look" before going any further. 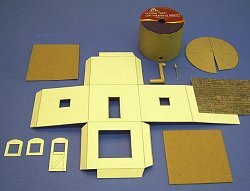 Using black acrylic paint, paint the window and door frames and any exposed edges of cardboard that will not be covered when the printed siding are applied. This includes the underside of the roof piece where it will jut out over the tank edge. Paint the water spout the color you chose (usually black or dark brown). As the photo to the right shows, you can use strips of cardboard to give the roof some "ribs." When the glue is dry, paint the roof your color of choice. Paint the bases your color(s) of choice - obviously, you only really need to paint the outside 1/2" or so and the outside edge. Apply the printed graphics to the tank and "stone walls." Do a section at a time. Measure carefully, make crisp folds, apply glue and press in place. You're better off leaving the graphic paper a tad long than a tad short. 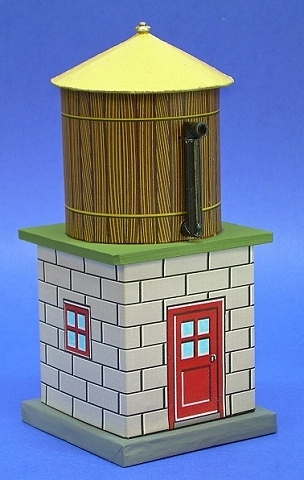 Paint the door and windows (unless you are making the tinplate version). While they are drying, glue the "glazing" (yellow paper or whatever you choose) into place. Apply the horizontal "bands" that hold the tank together. You may use brown florist wire or small strips of dark brown paper. Glue the structure together. The photos above show the finished structures before any frost is applied. For the "bands" that hold the tank on the left together, you can use brown florist wire or small dark brown strips of paper. When all of the the glue is dry, examine the structure thoroughly. You may see white edges of the paper that the graphics are printed on when you cut pieces to fit various surfaces. With a felt-tip pen, marker, or acrylic paint and a very tiny brush, carefully coat just the edge of paper and touch up the edge of cardboard if needed. If you want to add a holiday sparkle, when all the glue and satin spray has dried, use clear glitter sprinkled over Elmer’s Glue-All to add little touches of frost. Paul speaking here: When Howard was done taking photos for this year's Spook Hill projects, he sent me the station and water tower he had built while creating this project. Due to Howard's careful craftsmanship, this fun project has produced what could easily become a family heirloom. Once again, I am glad to be able to help Howard bring his project ideas to our readers. You could use different colors of celophane and trim to create a railroad setting for Christmas or any other season. With a little redesign, you could use these projects as the basis for a realistic country station on a "serious" O-scale model railroad. 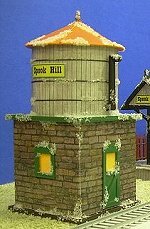 Other articles about Halloween houses, villages, and trains include our Spook Hill™ series, which includes the following free project plans and graphics for a frighteningly fun Halloween. 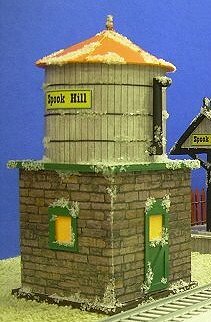 Spook Hill™ Station - the FIRST-EVER model train station designed specifically for a Halloween display. 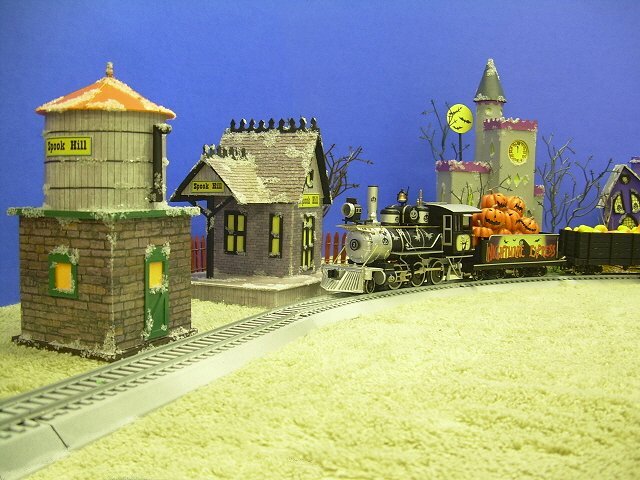 Halloween Trains - an index of collectible trains and towns that will increase your October decorating fun. Building a Vintage-Style Barn and Silo - this isn't technically a Spook Hill™ project, but it looks great with the Spook Hill™ structures or with many other kinds of trains and towns. Other articles about tinplate-inspired houses include our Tribute to Tinplate™ series, which includes easy-to make stations, houses, street lamps, and other accessories to bring a vintage, lithograph-inspired feel to your train or town.